A mechanical insulation system is a large investment with undeniable benefits, so any facility or commercial building wants their insulation to last as long as possible. Luckily, insulation has few or no moving parts, does not need to be oiled, and does not need to have any batteries changed—it’s a system that optimizes operations and saves money and energy for many years with minimal upkeep. 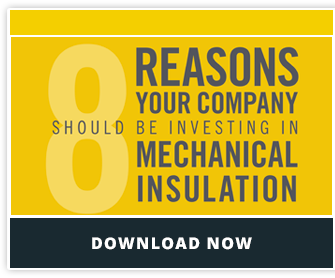 Even though mechanical insulation is relatively low-maintenance, there is information you need to know in order to increase the life of your insulation system. Here are three ways to make sure you receive the highest possible ROI. Most mechanical insulation is either in commercial or industrial applications. There are several differences between these two types of installation that can factor into the likelihood of insulation damage. The majority of commercial insulation is installed indoors in a wall, plenum area, or a location that never encounters human contact, meaning it is unlikely the insulation will be damaged. Most commercial jobs, if installed correctly, will easily last more than 25 years with little or no maintenance. One area where damage can occur in indoor commercial applications is in mechanical rooms. If maintenance personnel are working on the equipment, they may damage the insulation by climbing on it, leaning ladders against it, laying tools on it, etc. 85% or more of industrial mechanical insulation located outdoors and subject to damage due to weather. There is also an increased potential of personnel working around the piping, making these systems much more susceptible to damage. The increased likelihood of damage that comes with an outdoor industrial application must be taken into consideration during the system design if it is going to perform for a long period of time. Another common way insulation becomes damaged is during new construction. Often other trades walk on or inadvertently scrape against the insulation. This can be avoided if the construction schedule is properly managed or other workers are taught to avoid the insulation. Seemingly small abuses and damages to an insulation system can add up over time to thousands of dollars’ worth of repairs. By understanding the root causes of mechanical insulation damage, you can take steps to protect your investment. One effective way to do this is to use protective jacketing. Jacketing the insulation with metal, PVC or a polymeric/metal foil laminate will improve its resistance to damage. However, keep in mind that it will not make the system completely damage-proof. Engineers often specify protective jacketing when selecting materials for construction. A common scenario is to specify jacketing on all piping that is at ground level up to 8 feet in the air. Jacketing is also often an integral component of certain types of insulation, but is usually not solely intended to prevent abuse. Installers will normally provide protection on any systems installed outside to shield them from water damage. After insulation has been installed, it is the facility/plant manager’s responsibility to schedule periodic inspections. This will help discover any signs of damage early on and reduce repair costs. If damage is left too long, it could escalate into an even larger repair. The most effective way to do this is by having a professional insulation contractor perform the inspection. They are trained to recognize signs of damage and make recommendations for improvement. You should also implement a mechanical insulation maintenance plan within your facility to get everyone on board with protecting the insulation. Many insulation contractors can also utilize a thermal imaging camera to identify whether mechanical insulation is performing as designed. Mechanical insulation is a valuable asset to a building’s infrastructure. When it is properly installed and maintained, insulation can provide ROI for over 20 years.